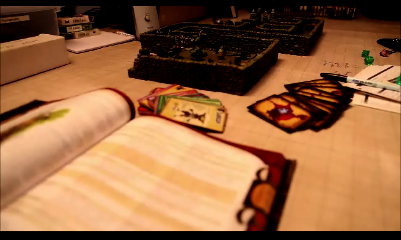 Don't think your sweeping novella of a tabletop experience can get any more immersive? Well it tickles us greatly to inform you of your sweeping wrongness. Just what is that magical ingredient that takes a visual story (whether movies, shows, and games) to the next level? Why it's sound! But if you won't take my word for it, then surely you'll listen to the folks behind BattleBards, because really how could you not. Our fine friends at BB have created something so unique and original that these qualities almost eclipse how cool it is. After successfully kickstarting their realmsound project (insert link), Orange County Game group has leveled up and is releasing BattleBards, a fully integrated database of sound clips, music, and other goodies designed to bring your tabletop campaign to life in ways never before seen. Battlebards consists of a Soundboard, which allows GMs to quickly and efficiently organize audio clips needed for the session, as well as a mixer through which GMs can compose whole scenes with layered scores and sound effects. The Battlebards Soundboard allows for some quick, on the fly adjustments including track cropping, independent volume control, looping, multiple simultaneous playing of tracks along with the controls you’d expect from any media player. The Mixer will let you create entirely new sounds by being able to layer audio. This means your dream of staging a fully immersive battle for your underwater city of Aquopolis can actually bubble up into reality! What impresses JADE so much about BattleBards aside from the ingenuity on display is the team behind it. OCGG has their own lineup of Voice Actors and composers, with some notable credits to their names, recording original fantasy audio for your pleasure. The goal is to launch the web-based service with over 500 audio clips, a number only to be continually increased over time. BattleBards continues the trend of finding unbelievably neat gaming projects on kickstarter, ones which would probably never see the light of day if we didn't live in the glorious era of crowdfunding. Of all the ways to make tabletop RPGs more epic, this might just take the cake. Ask yourself would we have laughed and cried as much with Maximus without Hanz Zimmers ethereal Gladiator score holding our emotions hostage? Would we have feared Darth Vader as much without his deep voice and ominus breathing? And would we have really believed that Roses heart really did go on without that majestic Celeine Dion number mercilessly drilling that message deep into our craniums? Don't answer that. Lets find out more about Orange County Gaming Group. 1) What's your name and where are you based? 2) What got you into design RPG tools? We’re not strangers to the use of audio in gaming. Alex, the resident GM of the group has been heavily using audio in his games for 15 years and after too many sessions being ruined by YouTube ads and the scrambling of files among several media players, the frustration became too much. So as we got the idea of creating professionally made audio, we also knew that the tools to bring all that audible goodness closer to the GM was mandatory. Bringing high end audio to the gaming table is a natural evolution to the tabletop experience. The example we love to use when explaining the transformative power of audio at the table is to watch the Star Wars opening crawl without John William’s score in the background. An even funnier example is this rendition of the Star News A New Hope Ceremony scene at the end, again, without John Williams’ score. https://www.youtube.com/watch?v=Tj-GZJhfBmI. It’s the same way with gaming. In a game that uses the collective imagination of the GM and players, there’s so much to be said for tools that help dial in everyone’s emotional states. When the GM has a dramatic or touching scene that’s unfolding and the lingering effects of the most recently joke about Game of Thrones is still floating in everyone’s minds, dropping a score like Dumbledore’s Farewell instantly directs that energy where it needs to be. 4) What is the biggest challenge you've faced? Coming up with tracks that most fantasy gamers can agree are needed is always challenging. We all come from different gaming backgrounds and play styles so even with something that’s relatively a no-brainer like “Elven Language” or “Goblin Monsterscape” carry with it nuances which vary greatly from one gamer to another. For the Goblin Monsterscape, how high pitched should the voices be? Are most gamers OK with some sort of language in the background to that track or do many think that screams and yells are more appropriate? The beauty of Battlebards is that we’re going to be able to cast a much wider net, allowing those tracks that meet with our strict quality standards into the library, each offering a different angle to the piece. 5) What do you have in the works now? Well right now, the focus is on the Kickstarter. We’re hoping that we’ll be able to not only get funded but also bring down some stretch goals we can push the envelope of the amount of audio we’re going to be able to offer. Funding will also allow us to explore an ever greater range of audio needs, from the ‘mainstream’ like a zombie monsterscape to the exotic like a volcano soundscape. Absolutely crushing the Kickstarter will allow us to develop specific apps and even accelerate expanding into other genres like sci-fi and modern. There’s so much we’re all into but to provide an answer that doesn’t span pages and pages where we point out favorites in PC games, console games, board games, etc. We can say with confidence that on the tabletop side of things, where we draw our inspiration for this whole quest of ours, our heart lies in D&D 3.5 and more and more, warming up to 5E. Mike - As far as tabletop games go I really don’t think that they get the whole dog and pony show that video games get, although D&D 5e WAS number 1 best seller release week. With that side I’m going to say Destiny. Let me elaborate, with all the hype this game got I think gamers were expecting this revolutionary next saga experience akin to Halo. It had the largest budget of any game, I believe, to date at about 500 million and while it looks great I feel that is too short and the enemies are VERY similar. I think I can safely say we as a collective group expected more on launch day, and I know that supposedly there is a 10 year plan in place on this game with new content coming out regularly, I feel it just falls really short from the tree or even scope of Halo CE. Not to mention the end game content is just grinding, not a particularly favorable end game and don’t get me wrong this is not the only game to have this issue, Star Wars the Old Republic had similar issues. I just see this being very DLC heavy and for $99.00 on launch with both planned DLC included for what feels like half a game just very lack luster for something that was supposed to replace the Halo franchise. Oh not to mention no trading whatsoever. Has got to be the one where at the top it says “Dungeons and Dragons: where a 3 mile walk takes 3 seconds and a 3 min fight takes 3 hours”......so true, although 5e IS much more streamlined in this respect. 9) What game character would you be out of any? Alex - My favorite characters of all time would be my D&D characters DeadTime and Soul Collector but for examples others can relate to, I’ll go with Kyle Katarn from Star Wars: Dark Forces. Alex - Neutral Good: Do the greatest good, divorced of other considerations. Mike - Chaotic Good: I like having the freedom to do what I want without derailing games. Alex – Magic baby! Open your mind to the possibilities! Mike - Melee. Nothing better than getting in there and mixing it up! 12) Old school or new school? All of us here can agree, leverage the new school advances in rule integration and the use of digital tools but keep the rich tapestry of old school mechanics. Forcing us to choose one or the other is like asking which child you love the most. We’re sorry, we just can’t answer. Whether day dreaming as heroes delving the deepest dungeons or X-Wing pilots (TIE pilot for Mike) facing down a capital ship, we hold them both quite dear. Alex – It’d have to be when I was playing a D&D “sort of Jedi” (SEE!?) which translated into a Psionic Warrior with Vow of Poverty, Sandalphon. I was notorious for missing fights since it would take me so long to buff myself so one time, the GM said that a fire giant was coming at us from the distance, with whatever time I needed to buff before I engaged. Well, as a level 7 guy, I finally got to blow all of my powers into making myself a mega glass cannon and when I charged in, I crit’ed with max damage, one-shotting that sucker with a quarterstaff. Mike - Hmmmm….my rolls are usually so bad it’s not me that does the winning but getting healed off the ground. I would have to say the time I talked way out of getting my character’s head chopped off by the “Batman” of the town. 15) In a battle for middle earth where would you be? Alex – Everywhere. The wandering wizard keeping the kingdoms of men together will always be needed. And if expunging curses from kings isn’t enough to unite them, than a bolt of lightning should do the trick! Mike - Can I be a ring wraith? Thanks Battlebards! Great to see your new product, all the best in the future, and as always Happy Gaming!